A few weeks ago, I took my Lego-obsessed 9 year old son to see the Lego Movie, and thus claimed the title of World’s Most Awesome Dad (at least until my son’s bedtime rolled around). The Lego Movie was awesome. I don’t think it’s in theaters anymore, but if you missed it, I recommend you see it when it comes out on DVD, even if you don’t have kids (for after all, aren’t we all kids at heart?). Knowing my son, I’m guessing we’ll be buying the Lego Movie DVD when it is released. I am constantly reminded of the movie by my son, who seems to build a new Lego creation almost everyday, and often answers questions with the phrase, “Well, what would Emmet do?” My son constantly hums the Lego Movie theme song, “Everything is Awesome,” which means the song is now always playing in the back of my mind, in fact, it’s playing in my head right now as I write this post. The plot for the Lego Movie is pretty straightforward. Emmet Brickowski, your typical “regular Joe” normal everyday-kind-of-guy Lego construction worker minifigure, accidentally stumbles upon and finds the key to saving the Lego Universe from the evil tyrant, Lord Business. Emmet joins the rebel group of expert Lego Master Builders (humorously cast as Lego minifigures Batman, Superman, Wonder Woman, Abraham Lincoln, William Shakespeare, Gandalf, Shaquille O’Neal, etc), who assume that since Emmet found the key he must also be a Master Builder and is thus just as amazing and talented as they are. The Master Builders haven’t been successful in their rebellion again Lord Business, but now they believe that Emmet has arrived to save the day. Emmet initially doubts he can do it (after all, he’s just a regular guy, like me, like my son, and like all the other parents and kids in the movie theater), but during the course of the movie, he learns to believe in himself and in the end, he does save the day, and saves the Lego Universe. I don’t want to spoil the movie, other than to say it does have a Hollywood-worthy happy ending, and the movie is awesome. The Lego Movie also teaches us four timeless marketing lessons. The premise of the Lego Movie is pretty basic. Emmet, an ordinary Joe, is expected to save the (Lego) world. But all he knows how to do is follow instructions. He doesn’t know how to create amazing things like the expert Master Builders, and Emmet wonders what he can do to help. However, we soon see in the movie that although the Master Builders are super creative, the evil Lord Business, anticipates and thwarts their every move. The key turns out to be doing the unexpected, which is actually following the directions. In the real (marketing) world, this translates into knowing and following the fundamentals. There are no silver bullets or shortcuts to marketing success. Marketing is hard work and takes time. The basics matter. You need a good product or service. You need excellent customer service. You need to stay current with the times, embracing social media, while not forgetting the best “old school” marketing tactic ever, word-of-mouth. Emmet ‘s rule-following mentality and ability manages to get him into the evil Lord Business’s hideout, but then it’s the lessons he learns from the Master Builders that allow him to defeat Lord Business. He needs to think outside the box, and try new and different things, like a double-decker bunk couch (if that idea doesn’t make sense, you need to see the movie). In the real world, it’s the same thing. Successful businesses think outside the box. One of the easiest ways to get more business exposure, and thus more business, is to create something that goes viral. But the key to viral content is that it has to be new, different, and fresh. Don’t just copy the competition with your social media campaign, you need to be unique. The Lego Movie follows in the footsteps of Toy Story and other successful blockbuster kids’ movies since then. My nine year old son loved the movie, but so did I. It had humor and jokes for both kids and adults (kid-appropriate jokes of course). I think I may have laughed even harder than my son, and I certainly enjoyed the movie just as much as he did. Hollywood realized with Toy Story, that the key to success with kids’ movies was to make a movie that was also enjoyable for adults. Do that with your marketing as well. Know your audience, but also target as diverse of a crowd if you can. Don’t get too “niche-y” with your marketing, where some left-out potential customers are scratching their heads saying “huh”. I often see marketing campaigns that are too targeted and rely too much on the inside-joke mentality. And if you’re targeting kids, remember it’s the parents who have the money, and they need to be convinced as well. 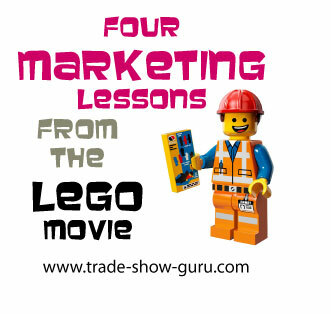 So there you have it, four timeless marketing lessons courtesy of the Lego Movie. If you haven’t seen the movie yet, see it when it comes out on DVD. And then you too can have that incredibly catchy and upbeat tune, “Everything is Awesome”, playing in your head through out your work day.